“If you concoct, ‘I am more intelligent than my Guru,’ ‘I can make additions and alterations,’ then you are finished.” — Srila Prabhupada lecture July 12, 1975 Philadelphia Pa.
…And as soon as you manufacture, fall down. This manufacturing idea is very, very dangerous in spiritual life. …Our mission is to serve bhakta visesa and live with devotees. NOT THAT YOU TAKE THE PLACE OF GURU. THAT IS NONSENSE, VERY DANGEROUS. Then everything will be spoiled. As soon as you become AMBITIOUS to TAKE THE PLACE of GURU-gurusuh nara matih. That is MATERIAL DISEASE. “You are all helping me in the execution of my mission so please do not try to do anything beyond the jurisdiction of my instructions. My will I have already disclosed to you all that each and every one of you should chant the Mahamantra regularly in sixteen rounds, follow the four regulative principles, chant Hare Krsna mantra on the streets, try to distribute our books and literature, and specifically in San Francisco you should observe the annual Ratha Yatra festival very gorgeously. “The answer to your Istagosthi questions are as follows: Unless one is a resident of Krishna Loka, one cannot be a Spiritual Master. That is the first proposition. A layman cannot be a Spiritual Master, and if he becomes so then he will simply create disturbance. And who is a liberated person? One who knows Krishna. It is stated in BG, fourth chapter, anyone who knows Krishna in truth is immediately liberated, and after quitting the present body, he immediately goes to Krishna. That means he becomes a resident of Krishna Loka. As soon as one is liberated he is immediately a resident of Krishna Loka, and anyone who knows the truth of Krishna can become Spiritual Master. That is the version of Lord Caitanya. So to summarize the whole thing, it is to be understood that a bonafide Spiritual Master is a resident of Krishna Loka. INTERNATIONAL SOCIETY FOR KRISHNA CONSCIOUSNESS LTD.
FOUNDER—ACHARYA, His Divine Grace A.C. Bhaktivedanta Swami Prabhupada. Dear President, Prabhus, please accept my humble obeisances. All Glories to Srila Prabhupada. That there should be no dealings between you and Prabhupada’s so-called godbrothers. They are all jealous and are all trying to do harm to our mission and also to Srila Prabhupada. So without Srila Prabhupada’s permission, no one should correspond with any of them, and no one should have anything to do with them, without asking Srila Prabhupada. No one should give them any of Srila Prabhupada’s books, no one should purchase their books, no one should visit their temples without authorization. I hope this is clear. It is very important. Please instruct all your devotees regarding this. [ crossed out words ] And when the devotees come for the annual festival, you should also instruct them not to visit or have any dealings with any of the godbrothers. I hope this is clear and I hope this meets you in good health. In 1973, I was staying in Mayapur. Srila Prabhupada came there with his secretary and a small group of devotees. Somehow, one of his disciples, a Sanskrit editor, decided to go to the Chaitanya Math to discuss something with the pandits there. It was an innocent mistake, as it turned out, because he felt that he needed some further understanding of Bengali language to round out his service as an editor. I was not part of the subsequent meeting with His Divine Grace, but heard it second-hand from the devotees who were present. Srila Prabhupada was extremely upset about his meeting with the local Gaudiya Math Godbrothers. For 45 minutes, Srila Prabhupada chastised this disciple very heavily. The description of that meeting and the tense mood was like a bomb had gone off. It was not often that Srila Prabhupada became angry, but this was one of those times. I was not inclined to visit the local temples, except during Parikrama, but I vowed I would never even dream of going there on my own, what to speak of taking initiation from any of Srila Prabhupada’s Godbrothers. I’m sure there are readers of this website who have similar stories of Srila Prabhupada’s disapproval of association with his Godbrothers. For those who weren’t present when His Divine Grace was manifest, there were times of very heavy chastisement meant to guide and protect us from danger. The danger in this case was that his Godbrothers were envious, and took every opportunity to minimize the importance of their Godbrother, Srila Prabhupada. He didn’t want us to be subjected to their criticism of ISKCON, and took it upon himself to warn us in no uncertain terms that we were never to go to any of his Godbrother’s temples for any reason whatsoever. Of course, there were times when His Divine Grace visited the temple of Srila Sridhar Maharaj, and with the attendance of His Divine Grace, we all visited his Math. But, to visit on one’s own initiative was strictly forbidden. Now, so many years later, if someone says that things are different now, that it’s ok to go and associate with any of Srila Prabhupada’s Godbrothers, take initiation, live there, and still consider themselves a follower of Srila Prabhupada, what can I say. I just wouldn’t want to be in the room when His Divine Grace learned that we had disobeyed his order not to go there. Please accept my humble obeisances. I am in due receipt of your letter dated on November 24, 1970. Perhaps you are my only Godbrother who has appreciated my humble service to the cause of Guru Gauranga. All my other Godbrothers are very much envious, as I can understand from their behavior. to Gorakpur. From Gorakpur I shall go to Allahabad, and most probably from Allahabad I may go to Vrndavana. So far as Mayapur is concerned, I do not think I shall be able to attend the Gaura Jayanti celebrations at there. The reason is that I have no place on my own, and certainly there will be too much crowd during the occasion. Therefore, I want to avoid this occasion. Sometimes after we may visit. I shall go to your place from Vrndavana or from Allahabad, and we have to arrange in that way. We are thirty men and women all together. Whether you want us all to visit? Perhaps if we go from Vrindaban we shall have to take advantages of the Grand Trunk Express. Of course there is sufficient time now, and I shall be in regular correspondence with you on my tour, but I accept to visit all the places mentioned by you when I go by that side. Srila Prabhupada’s most acute controversy in Madras was not with smarta-brahmanas, Mayavadis, or Saivites, but with some of his own Godbrothers. Although some of them acknowledged Srila Prabhupada’s incomparable preaching in the West on behalf of their spiritual master, Srila Bhaktisiddhanta Sarasvati, others were envious. One envious Godbrother wrote to Srila Prabhupada in Madras. (II) Have you Swamiji really got free of your ego? If so, why you said, “I challenge,” and why are words like “I” and “my” always on your lips? (III) Why do you use a cushion unlike a real yogi-Did Lord Chaitanya use cushions? (IV) Why do you wear ring and a wrist gold watch? Are you not free from material attachment? In contrast to the venomous letter came a letter from Tridandi Svami B.V. Puri Maharaja, another of Srila Prabhupada’s Godbrothers. Puri Maharaja, as Prabhupada called him, had a small asrama in Visakhapatnam, on the Bay of Bengal between Madras and Calcutta. Hearing that Prabhupada was going next to Calcutta, Puri Maharaja invited him to visit. “With innumerable Satsanga Dandabats at Thy lotus feet, I beg to acknowledge the kind letter… The citizens of Visakhapatnam are very anxious to have the darshan of your holiness… We are exceedingly glad and eager to hear Sankirtana and the divine message from your holy lips. I hope the Sankirtana movement at Madras is attracting thousands of citizens. I remain dasanu B.V. Puri. Puri Maharaja’s asrama was a simple single-story building of about eight rooms. When he offered Prabhupada a room next to his own, Prabhupada was pleased, accepting it as an expression of friendship. Prabhupada relaxed with his Godbrothers, Puri Maharaja and Ananda Brahmacari, speaking with them in Bengali. Puri Maharaja said he appreciated Prabhupada’s work and his Western disciples. Prabhupada’s disciples had already seen formal exchanges of obeisances between Prabhupada and his Godbrothers, as when in Bombay they had seen Prabhupada get off his vyasasana and offer dandavats to his Godbrothers. But in Visakhapatnam they saw more intimate dealings. They saw for the first time Srila Prabhupada living comfortably, at ease, in the same quarters as his Godbrothers. And they didn’t feel themselves being treated condescendingly or superficially, or being regarded as oddities. Through Prabhupada’s guidance they began to learn more of the essential friendly and humble exchanges between Vaisnavas. In the late afternoon, a contingent of Gaudiya Vaisnavas led by Puri Maharaja came to pay their respects: Asrama Maharaja, Ananda Prabhu and many devotees from Vishakhapatnam and Rajahmundry. They talked and sang for Srila Prabhupada, and even massaged his body. Prabhupada begged forgiveness from them for any offenses he may have committed and called himself maha-patita. They immediately corrected him by saying Prabhupada was maha-patita-pavana. Asrama Maharaja: You are the eternal ruler. You will rule over us, chastise us, guide us. Prabhupada: Forgive all my offenses. I became proud with my opulence. Prabhupada’s Godbrothers: No, you never became proud. When you started preaching, opulence and success followed you. This is the blessing of Sri Caitanya Mahaprabhu and Sri Krsna. There can’t be any question of offense. “If one remains always a servant everlastingly of guru, then he is liberated. And as soon as he thinks that he is liberated, he’s a rascal. That is the teaching of Chaitanya Mahaprabhu…. You must be ready always to be chastised by guru. Then he’s liberated. And as soon as he thinks that “I am beyond this chastisement, I am liberated,” he’s a rascal…. Dear readers of this Letter. Pamho agt Srila Prabhupada. There is one very interesting point regarding the letter from Srila Prabhupada to Rupanuga from 28th April 1974 in relationship to Sridhara Maharaja. Srila Prabhupada: “You are right about Sridhar Maharaj’s genuineness. But in my opinion he is the best of the lot. He is my old friend, at least he executes the regulative principles of devotional service”. I must say this statement of Srila Prabhupada really confused me for many years. He seemed to be making the point that Sridhar Maharaj was genuine and that he’s the best of the lot and yet in the next breath he seems to be speaking sarcastically by saying “at least he executes the regulative principles of devotional service”. This seeming contradiction lodged within my mind, and did not surface until many years later at a time when I was visiting Alachua with Jitarati and my wife Lokadrsti. Jitarati wanted to meet with Rupanuga so I took the opportunity to accompany him. During our discussions with him “this seeming contradiction” that had been stored up for many years in my mind resurfaced. So I took the opportunity and asked Rupanuga to kindly clear up my confusion. Rupanuga said that In early 1974 he visited the Asrama of Sridhar Maharaj. He spent some time there and his realizations were very clear and strong about what was going on there. He stated that Sridhar Maharaja was trying to attract devotees away from Srila Prabhupada and Iskcon and over to himself. After crossing the Ganges and returning to the Iskcon Mayapura centre this fact was transmitted to Srila Prabhupada by mail. Now for me the mystery was unraveled. Without insight into what Rupanuga had personally observed at Sridhar Maharaj’s asrama and without knowing what he had conveyed to Srila Prabhupada by mail one would be excused thinking that when Srila Prabhupada said in his response to RUPANUGA “You are right about Sridhara Maharaj’s genuineness” that he meant that Sridhara Maharaja was genuine. This of course is not the case. Rupanuga had made it clear to Srila Prabhupada that Sridhara Mahararaj was going against vaisnava etiquete and he was not acting as a genuine well wisher of Srila Prabhupada or Iskcon. Thus one can understand that when Prabhupada said “you are right about Sridhar Maharaja’s genuineness” he was referring to the lack of it. “Srila Prabhupada said “He’s genuine and the best of the lot” (many ex Iskcon Sridhar followers would say) This very unfortunate misunderstanding is one of the main reasons so many Iskcon devotees went over to Sridhara Maharaj’s camp. 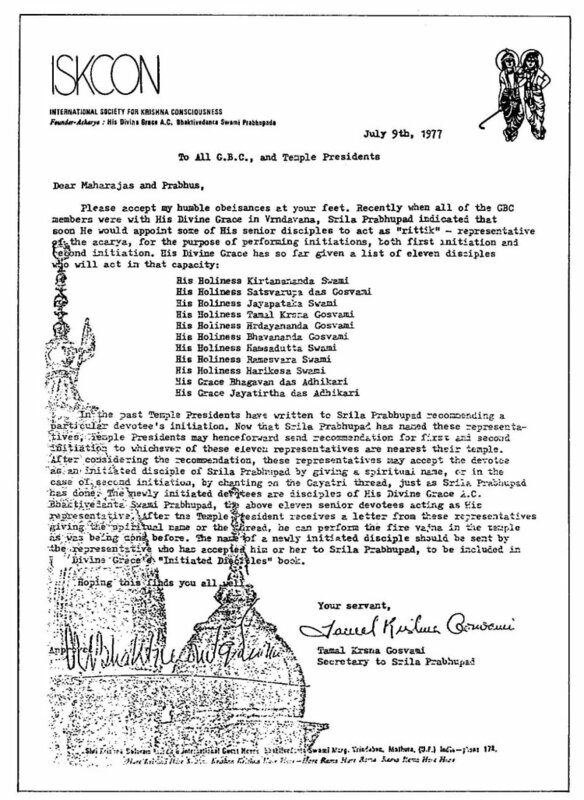 In the past Temple Presidents have written to Srila Prabhupada recommending a particular devotee’s initiation. Now that Srila Prabhupada has named these representatives, Temple Presidents may henceforward send recommendation for first and second initiation to whichever of these eleven representatives are nearest their temple. After considering the recommendation, these representatives may accept the devotee as an initiated disciple of Srila Prabhupad by giving a spiritual name, or in the case of second initiation, by chanting on the Gayatri thread, just as Srila Prabhupada has done. The newly initiated devotees are disciples of his divine grace A.C. Bhaktivedanta swami Prabhupad, the above eleven senior devotees acting as His representative. After the Temple President receives a letter from these representatives giving the spiritual name or the thread, he can perform the fire yajna in the temple as was being done before. The name of a newly initiated disciple should be sent by the representative who has accepted him or her to Srila Prabhupada, to be included in His Divine Grace’s “Initiated Disciples” book. 7) HOW are these conditioned soul opportunist gurus VOTED IN by fake GBC the Current Link? Please see below. Srila Prabhupada and his words are on the transcendental platform, therefore his purports to the SRIMAD-BHAGAVATAM is the CURRENT LINK. AS LONG AS WE HAVE PRABHUPADA’SPURPORTS TO THE SRIMAD-BHAGAVATAM HE WILL BE OUR CURRENT LINK**THE REAL** MESSAGE OF SRIMAD-BHAGAVATAM ARE***HIS PURPORTS***. Conditioned soul “gurus” manufactured by fake GBC are not ACARYA and consequently can NOT initiate. “By the mercy of the spiritual master one is benedicted by the mercy of Krsna. Without the grace of the spiritual master, one cannot make any advancement.” A disciple should never be a hypocrite or be unfaithful to his spiritual master. In Srimad-Bhagavatam (11.17.27), THE SPIRITUAL MASTER IS ALSO CALLED ACARYA. Acaryam mam vijaniyan: the Supreme Personality of Godhead says that one should respect the spiritual master, accepting him as the Lord Himself. Navamanyeta karhicit: one should not disrespect the acarya at any time. Na martya-buddhyasuyeta: one should never think the acarya an ordinary person. Familiarity sometimes breeds contempt, but one should be very careful in one’s dealings with the acarya. Agadha-dhisanam dvijam: the acarya is a perfect brahmana and has unlimited intelligence in guiding the activities of his disciple. In the past Temple Presidents have written to Srila Prabhupada recommending a particular devotee’s initiation. Now that Srila Prabhupada has named these representatives, Temple Presidents may henceforward send recommendation for first and second initiation to whichever of these eleven representatives are nearest their temple. After considering the recommendation, these representatives may accept the devotee as an initiated disciple of Srila Prabhupada by giving a spiritual name, or in the case of second initiation, by chanting on the Gayatri thread, just as Srila Prabhupada has done. The newly initiated devotees are disciples of His Divine Grace A.C. Bhaktivedanta Swami Prabhupad, the above eleven senior devotees acting as His representative. After the Temple President receives a letter from these representatives giving the spiritual name or the thread, he can perform the fire yajna in the temple as was being done before. The name of a newly initiated disciple should be sent by the representative who has acceted him or her to Srila Prabhupada, to be included in His Divine Grace’s “Initiated Disciples” book. a) To systematically propagate spiritual knowledge to society at large and to educate all peoples in the techniques of spiritual life in order to check the imbalance of values in life and to achieve real unity and peace in the world. b) To propagate a consciousness of Krishna, as it is revealed in the Bhagavad-gita and the Srimad-Bhagavatam. c) To bring the members of the Society together with each other and nearer to Krishna, the prime entity, thus to develop the idea within the members, and humanity at large, that each soul is part and parcel of the quality of Godhead (Krishna). d) To teach and encourage the sankirtana movement, congregational chanting of the holy names of God as revealed in the teachings of Lord Sri Chaitanya Mahaprabhu. e) To erect for the members and for society at large, a holy place of transcendental pastimes, dedicated to the personality of Krishna. f) To bring the members closer together for the purpose of teaching a simpler and more natural way of life. g) With a view towards achieving the aforementioned Purposes, to publish and distribute periodicals, magazines, books and other writings.